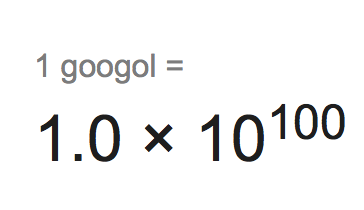 A googol is a term created by a 9-year-old back in 1920 to represent a really, really, humongous number (10 to the 100th power). When the founders of Google way back in 1997 were looking for a company name that would represent something very large, they checked to see if googol was available. But they misspelled it, resulting in the name Google, which is pronounced the same. And now you know.